2014-till present time, a member of academic council of Division of Innovations of Petersburg Nuclear Physics Institute and a member of scientific and technological council of Division of Innovations of Petersburg Nuclear Physics Institute. 2002-till present time, Petersburg Nuclear Physics Institute, Senior Research Scientist (equivalent to Assistant Professor). 2017, a member of the program committee of Workshop for precise atomic-molecular spectroscopy (Gatchina, Leningrad district). 2016, a member of the Advisory Board for International Hans Hellmann Prosymposium "Quantum Chemistry of Materials" (Saint-Petersburg). 2013-2015, Saint Petersburg State University, senior researcher. 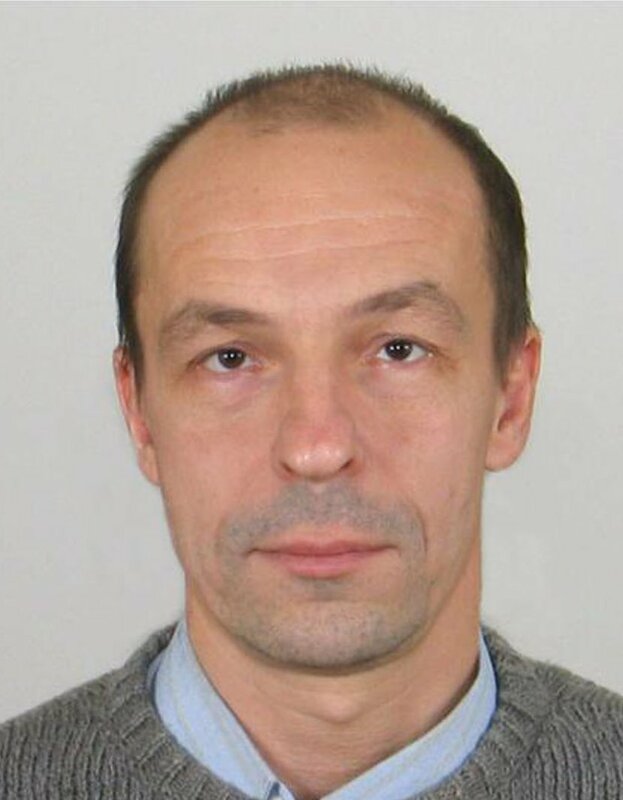 2006, a member of the organizing committee of Eleventh European Workshop on Quantum Systems in Chemistry and Physics (St.-Petersburg, Russia). 2000-2001, Petersburg Nuclear Physics Institute, senior researcher. 1996-2000, Petersburg Nuclear Physics Institute, researcher. 28.06.1996, PhD degree, thesis "Development of the Relativistic Effective Core Potential method". 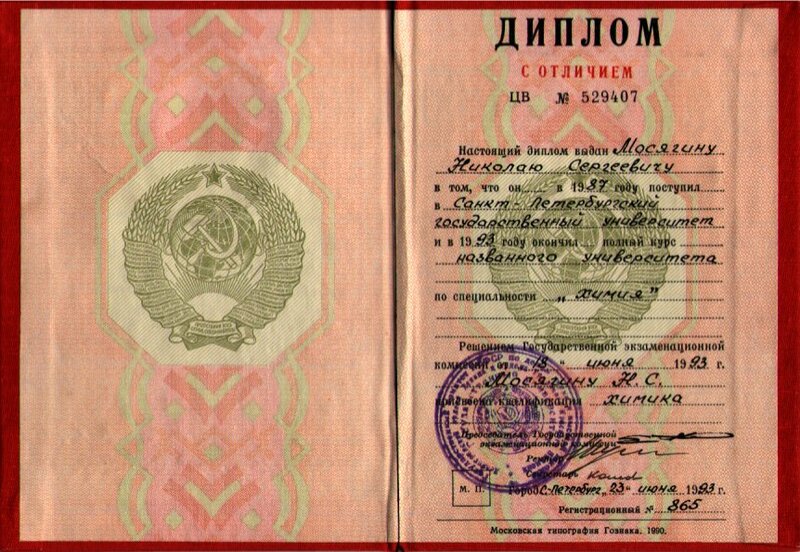 1993-1996, Petersburg Nuclear Physics Institute, Gatchina, Russia, postgraduate student. 1987-1993, St.-Petersburg State University, Russia, student. 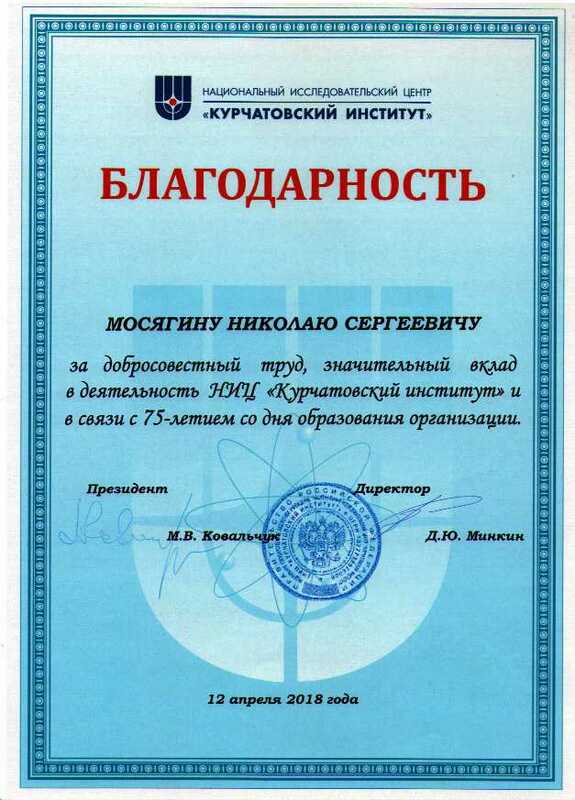 Acknowledgement from National research center "Kurchatov institute". Leader of grants of Russian Foundation for Basic Research, 2007-2009, 2010-2012, 2013-2015. Methods for precise calculations of correlation structure of molecules with heavy atoms. Relativistic effective core potential (pseudopotential). Basis sets for correlation calculations. Calculations of properties of superheavy elements from the "island of stability". Generalized Relativistic Effective Core Potentials (GRECPs) for the atoms Hg through Rn were generated [Tupitsyn:1995, Mosyagin:1997] which accuracy was up to one order of magnitude higher than that of other tested RECPs with the same number of explicitly treated electrons in carried out test calculations [Mosyagin:1997, Mosyagin:2000, Isaev:2000]. Then, the other developments in the GRECP generation were suggested, which allow one to simulate the Breit interaction and Fermi nuclear charge distribution [Petrov:2004, Isaev:2005] as well as the correlations with the core electrons excluded from the GRECP calculations [Mosyagin:2005] by economic way but with very high precision. Benchmark calculations of the spectroscopic constants for the HgH [Mosyagin-JCP:2001], Yb2 [Mosyagin-IJQC:2011], and Ca2 [Mosyagin-IJQC:2013] molecules were carried out with the generated potentials. The calculated spectroscopic constants were in good agreement with the available experimental data. The precise relativistic correlation calculation of electronic structure of the E112H molecule was carried out [Mosyagin-JCP:2006]. Theoretical predictions of properties of superheavy element 112 (E112 or eka-mercury) from the "island of stability" were required for its reliable identification. It was demonstrated that accounting not only for scalar-relativistic but also for spin-dependent effects is mandatory in calculations of superheavy element compounds even for Σ-states (where the spin-orbit contribution is suppressed in the leading order). The conclusion was made that the chemistry of singly-valent E112 rather resemble Hg than noble gas. The optimal GRECP versions for many elements of the Periodic Table were generated for employing in calculations of the various properties (see reviews [Titov-IJQC:2005, Titov-PTCP:2006, Mosyagin-IRAMP:2010, Mosyagin-IJQC:2016, Mosyagin-NPCS:2017]. A new procedure for the correlation basis set generation was proposed [Mosyagin:2000, Mosyagin-JCP:2001]. This procedure allows one to generate "equivalent" basis sets for the RECP (two-component) and the all-electron (four-component) calculations and to control efficiently the quality of the basis sets in description of correlations in different space regions. Moreover, the counterpoise corrections for these basis sets are practically undependent on some particular selection of the different valence atomic states for their calculations. For list of my last publications, see that page.